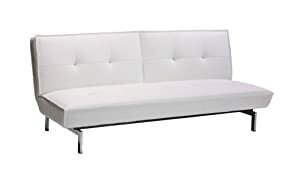 The Belle Revolution Convertible Sleeper combines rich tufted faux leather, chrome legs and clean simple design for a characteristically modern and stylish feel. Functionality is never compromised, and the unit is completely adjustable, allowing several different positions for multiple people at the same time. In seconds, this sleeper converts from a sofa to bed and anywhere in between. Hidden Support leg adds added stability when in sleep position.